Photo courtesy Mississippi State Athletic Dept. Jacob Sanford "Jack" Cristil, the legendary voice of Mississippi State University athletics, died on Sept. 7 at the age of 88. Cristil’s love for broadcasting came at an early age. The son of Jewish immigrants from Russia, Cristil noted years ago that his parents spoke Russian, Hebrew and Yiddish but allowed only English to be spoken in the house. His mother was a Russian revolutionary who escaped the czar’s forces. When he was six years old, his parents bought the family’s first radio and he discovered sports broadcasting. The idea that he could be sitting at home in Memphis and hear someone in a stadium far away telling him about a game “enthralled” him and he knew that would be the path he would eventually take. He started bouncing a ball in the street outside his home and doing play-by-play of imaginary games. After graduating high school, he served in World War II, as an aircraft engine mechanic in the U.S. Army Air Corps. He then briefly studied broadcast journalism at the University of Minnesota before returning to Tennessee and starting as the radio announcer for the minor league baseball team in Jackson, Tenn. He would announce baseball for teams in Anniston, Memphis and Clarksdale, joking that he worked his way up to Double-A baseball. While in Clarksdale he sent audition tapes to then-Mississippi State Director of Athletics C.R. "Dudy" Noble, having never been to Starkville. His announcing career for the Bulldogs began with a 34-6 win over then-Memphis State in his Tennessee birthplace on Sept. 19, 1953. Cristil called 636 football games since 1953, or roughly 60 percent of the football games played in the history of the institution. He was in his 54th season as the men's basketball play-by-play voice, having described the action of almost 55 percent of all the men's basketball games played at the school. In all, Cristil delivered game descriptions to Mississippi State fans across the Magnolia State and around the world for more than 1,500 collegiate contests. 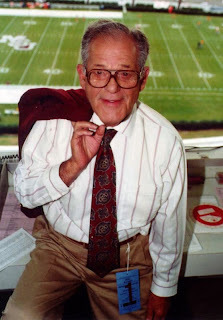 "Jack Cristil connected with generations of Bulldog fans and remains an icon for all who love the Maroon and White," MSU Director of Athletics Scott Stricklin said. "No school's broadcaster was as synonymous with their institution as Jack Cristil was with Mississippi State. Jack's passing leaves a large void, but I think all Mississippians appreciated his dedication and talent, and Jack will always be the Voice of the Bulldogs." Cristil was most recently presented the Lindsey Nelson Award, given annually to the nation's premier sports broadcaster. He was honored with the prestigious College Football Foundation Chris Schenkel Award in 1997 for excellence in college sports broadcasting. Nelson and Schenkel were longtime national award-winning broadcasters. In 1992, Cristil received the Ronald Reagan Lifetime Achievement Award from the National Association of Sportscasters and Sportswriters. That same year, he was also the first non-coach/non-athlete to ever be inducted into the Mississippi Sports Hall of Fame. Cristil was inducted into the Mississippi State Sports Hall of Fame in 2003. A winner of the Mississippi Sportscaster of the Year Award a record 21 times, Cristil was named the Southeastern Conference's Broadcaster of the Year in 1988. In a tribute to Cristil on the Senate floor in 2011, Sen. Thad Cochran noted that the university’s basketball team ignored an unwritten state rule in the 1963 NCAA men’s basketball tournament, which forbade any state university team from playing integrated teams. The team snuck out of town in the middle of the night to play Loyola in Michigan. “This was a significant blow to segregationist sentiment in Mississippi. Jack was right there with the team as it defied its own Governor to help move our State forward,” Cochran noted. After his retirement, Cristil participated in the production of a biography called "Jack Cristil: Voice of the MSU Bulldogs." The book, written by MSU journalist in residence Sid Salter with a foreword by author and MSU alumnus John Grisham, sold 10,500 copies and raised over $170,000 for the Jacob S. "Jack" Cristil Scholarship in Journalism at MSU. Earlier, Jack and Mavis Cristil had established a need-based scholarship in their name to benefit Lee County students at MSU with academic talent who needed help with tuition, books and fees. "Jack Cristil was a courageous, tenacious man possessed of a great love for Mississippi State University," said MSU Chief Communications Officer and Cristil's biographer Sid Salter. "His tired body finally failed Jack, but his keen mind and that great staccato baritone voice never failed him. I count his friendship as a tremendous gift to me and to my family. We all loved him." It wasn’t just the broadcast field that enjoyed his vocal talents. He frequently was lay leader of Shabbat services at Temple B’nai Israel in Tupelo. In June 2011, a stretch of U.S. Highway 82 in Starkville was named the Jack Cristil Highway, along the route he would take to Starkville from his Tupelo home. On April 28, that home was damaged as a tornado went through Tupelo. Cristil is survived by daughters Kay Cristil Clouatre of Baton Rouge, and Rebecca Cristil Nelson (Andrew) of Tupelo; grandchildren Jake Clouatre of Baton Rouge, and Lindsey Newhall of Tupelo. He is also survived by two sisters, Zelda Cristil Esgro of St Louis, and Miriam "Mimi" Cristil Lapides of West Palm Beach, and a number of nieces and nephews. Cristil was preceded in death by his wife of 33 years, Mavis Kelly Cristil, in 1988. He was also preceded in death by his parents, Mollie Kabakoff Cristil and Benjamin Herman Cristil of Memphis, by a sister, Charlotte Cristil Hiller, and by brothers Harold Cristil and Stanley Cristil. Services will be at 11 a.m. on Sept. 10 at the Tupelo Chapel of Holland Funeral Directors. Visitation will be from 4 to 8 p.m. on Sept. 9 and 9 a.m. until service time on Sept. 10. A public memorial service on campus will be announced. In lieu of flowers, the Cristil family requests memorials to the Cristil Scholarships at MSU, the Girl Scouts Heart of the South or Sanctuary Hospice House.